These cute crochet baby leg warmers have a nice lace and unique texture to keep your little ones nice and cozy in the cold weather. 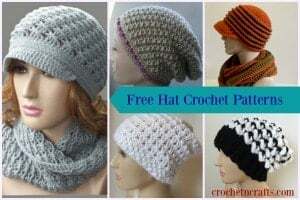 The pretty stitch makes them perfect to go with a little girls skirt, but can also be worn with shorts or underneath a pair of pants for extra warmth. The pattern is also very easy to adjust in size, making it a great go-to pattern for girls and women of all ages. And it’s not just a leg warmer pattern, you can easily shorten them for a pair of cozy boot cuffs if you want to. 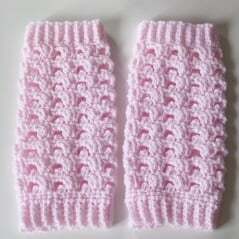 These baby girl leg warmers can easily be adjusted to any size that you want; from newborn to adult. All you do is continue with row two until they will be wide enough to fit around the leg. Also, you want to make sure they will be wide enough to slide over the foot as well. If you are making them to fit an adult size, you might want to increase the beginning chains for the ribbing rows as well. They are about 1″ with 5 sts, and (in my opinion) it looks better with 2″ for an adult size. The two ends are then joined with a slip stitch, and you begin working in a round until they are high enough. Then for the top ribbing, you once again work in a row. And here is a tutorial on how to crochet rounds 3 and 4: Picot Lace Stitch. And to attach the top ribbing, you may want to refer to this tutorial. Yarn: Bernat Baby Sport, or any yarn you have on hand. Hook Size: E 3.50 mm, or any hook suitable for the yarn. Stitch Marker: If you don’t have one, use a safety pin to mark the next stitch. Gauge: Not Important as you can make them to fit any size. Repeat row 2 until it is long enough to fit around leg, and making sure to end with a multiple of 4 for the row count. Ch 1, working into sc of last row and into free lps of first row, sl st into each st across to join the two ends. Rnd 1: Ch 1, sc evenly around, making sure you end up with a multiple of 4. Join with sl st to first sc. Rnd 2: Ch 1, sc in same st as join and into next st, picot, *sc in next 4 sts, picot; rep from * around to last 2 sts, sc in last 2 sts. Join with sl st to first sc. Rnd 3: Ch 1, sc in same st as join; *ch 5, sk next sc, sk picot and next sc**, sc in next 2 sts; rep from * to last st ending last rep at **, sc in last st. Join with sl st to first sc. Rnd 4: Ch 4 (counts as first tr), *(sc, picot, sc) in ch-5 lp**, tr in next 2 sc; rep from * to last sc ending last rep at **, tr in last sc. Join with sl st to first tr. Repeat rnds 3 & 4 until you have reached about 2 inches from desired length. Then Repeat rnd 3 once. Next Rnd: Ch 4 (counts as first tr), 2 sc in ch-5 lp, *tr in next 2 sc, 2 sc in ch-5 lp; rep from * around to last st, tr in last st, join with sl st to first tr. Last Rnd: Ch 1, sc in each st around, join with sl st to first sc. Row 1: Ch 6, sc in second ch from hook and in next 4 chs, then working into both lps, sl st in corresponding st of the last rnd (same st as previous join), sl st in the next st in rnd. Place stitch marker in next st of rnd to mark the place for the next sl st. Turn. Row 2: (Working in back loops only), Do not ch 1, sc in 5 sc lengthwise. Turn. Row 3: (Working in back loops only), ch 1, sc in each sc across, then working into both lps, sl st in next st of rnd (where stitch marker is), sl st into next st. Place st marker in next st in rnd to mark the place for the next sl st. Turn. Repeat rows 2 and 3 until you have worked your way around the legwarmer. You should end up with the same amount of rows as you had stitches in the last rnd. Ch 1, working into sc of last row and into free lps of first row, sl st into each st across to join the two ends. Fasten off. I am fairly new to crocheting and I seem to be doing something wrong. When I get to rounds 3 & 4 it just keeps getting bigger and expanding out instead of climbing up. Any help you could give would be greatly appreciated. I’m making these for my 9mo old to save her poor knees when she crawls around since it’s a little hot for pants. Thank you. Thank you so much this is wonderful. I can definitely see what I was doing wrong. Can’t wait to whip a pair out for the kids. Very helpful indeed. I must be stupid or something, but I can’t figure out how to start Round 1. I’ve connected the two ends of the top cuff, and ch 1. I’m not sure where to insert hooks for sc. Do you have a video tutorial of making these legwarmers? Thanks so much for sharing your pattern. Can’t wait to crochet these for my niece’s new baby girl who’s arriving in approx. 2 weeks. This is a beautiful pattern. Thanks so much for sharing. Going to whip these up quick for my daughter’s thanksgiving outfit. I am in love with this pattern, it is for the most part very easy and the bits that I had difficulties with, sorted themselves out as I put in the stitches. I am making them toddler sized and found if you don’t add a picot in one of the spots on the first round of picots and make that spot on the next round a 6 or 7 sc, it doubles as a wonderful fingerless gloves pattern!